Just as cooking with beer works extremely well, cola is used in cooking throughout China—and beyond. Coca-cola is perhaps the most common in China, but Frito-Lay isn't a division of Coke. It's a division of PepsiCo. Thus, Pepsi-Cola chicken-flavor Lay's potato chips. The chips launched earlier this year, and the flavor is less fizzy, more barbecue like, with a sugary aftertaste, reports Ad Age. 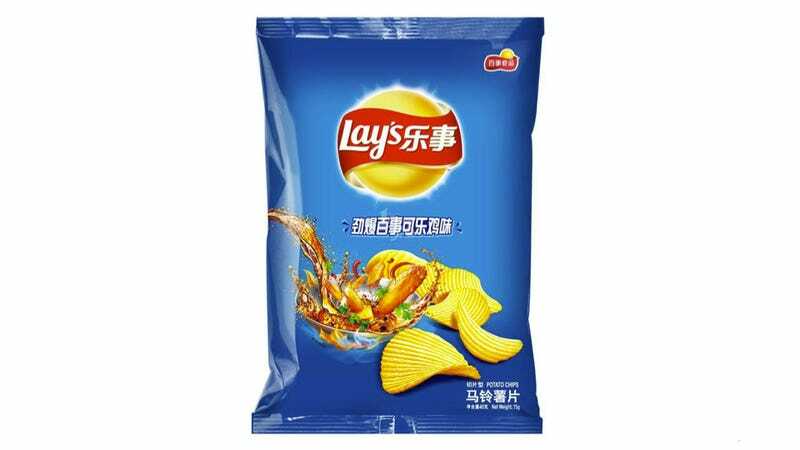 And the Pepsi meets Lay's collaboration is a match made in Chinese pun heaven. Putting the brand names together, you get a double meaning: "Anything can be happy" and "Pepsi can become Lay's." Lay's already has a stable of adventurous flavors, such as "Cucumber" and "Kiwi" as well as a slightly more traditional cracker flavor, "Fried Prawn".